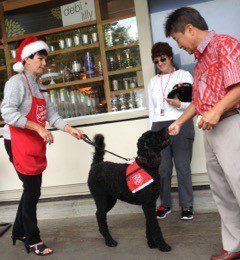 Labradoodle causes a stir outside a Red Kettle in Honolulu. 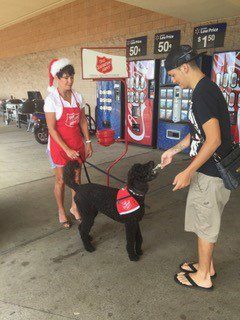 Honolulu’s number one Red Kettle bell ringer just might be Sydney, who has been known to double the donations compared to most kettles. “I guess if kettling was a sport, you’d call her a ‘ringer,’ said Barbara Wallace, Donor Relations Director for The Salvation Army Hawaiian and Pacific Islands Division. 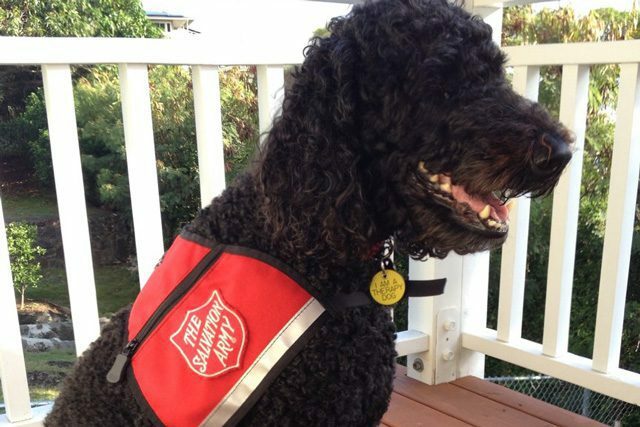 Unlike most bell ringers—and the secret to her success—is that Sydney is a labradoodle, a therapy dog who also volunteers at The Salvation Army Ka ‘Ohu Hou O Manoa Transitional Housing for women and children. Registered with Therapy Dogs International, Sydney passed an intense obedience test to ensure her personality and behavior are suitable for public visits. 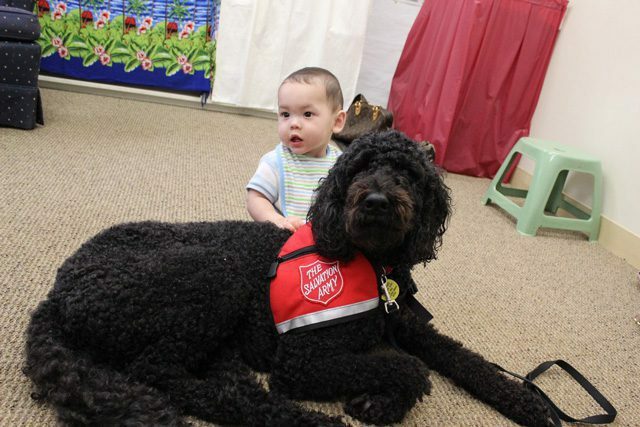 Since she’s a labradoodle, she is non-shedding and hypoallergenic—perfect for therapy work in public places. During the Christmas season, she stands kettle, helping to bring in the funds needed to maintain Salvation Army services within the community, such as the transitional housing program. Wallace is Sydney’s owner and trainer; she’s had her since she was a puppy. Realizing Sydney could be useful in kettle work, Wallace taught her to ring a bell with her nose and retrieve a dollar bill. They stop to watch Sydney perform and start chatting. When Wallace tells them she’ll take their money right out of their hand, out come the dollar bills—sometimes fives or tens. And that’s how Sydney brings in such outstanding results. Now that Sydney is a senior—12.5 years old—she is in semi-retirement from her regular “job” at the shelter. Wallace said she’s still energetic and is often told she doesn’t look or act her age. Two years ago, however, a vet surgeon replaced her torn ACL with metal, so Wallace now babies that leg, mindful that the kids at the shelter can be pretty tough on her. Sydney still visits the shelter, but not on a regular schedule. When she does visit, spirits rise. “Sydney’s here! Sydney’s here!” one little boy will exclaim when Wallace and Sydney show up. He loves to hold her leash and walk her around the yard and have her perform tricks on his command: sit, shake, bow, play dead, ring a bell. When it’s time for them to leave, he tries to follow them to the car. ← Previous Story Are you a holy family?